Looking for Walkway Power Washing in CT? 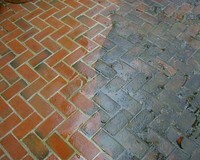 You simply won’t believe the difference power washing your home and walkways can make! Over time, dangerous mold, mildew and moss can develop on our roofs, siding and walkways. It happens gradually and we don’t always notice it. If you want to spruce up the appearance of your home for any reason or if you’re trying to sell, walkway power washing in CT is necessary. Blue Mobile Power Washing wants the whole exterior of your house to look divine. Not only do we do roof, window and side panel cleaning, we are also the best in the Connecticut power/pressure washing business when it comes to decks. Blue Mobile Power Washing will leave your house looking brand new and fresh guaranteed. Call today for a free, prompt, no-hassle estimate. At Blue Mobile Power Wash, our success as a company goes back to your satisfaction in our work. We are good at what we and want to prove that you you by offering you our services. Prices are always upfront, honest, and reasonable. We have all the technology, old and new, to get the job done. We promise to treat your home as if it were our own. Call 203-870-8168 for fast, friendly walkway power washing service in CT! I need Walkway Power Washing... can I get a free estimate?